Is it time for you to get a new sleeping bag? Maybe your current one is showing the signs of wear and tear? Or you want to upgrade to a warmer or lighter sort of bag? Possibly, this could be your first ever purchase of a sleeping bag (which means you could be a little amazed by the variety on the market). But how do you choose a sleeping bag? What do you look for in a sleeping bag? I am going to tell you straight up – it’s not easy. If you go into a camping store there are a few things you need to know before you go, to make the right choice. It's thinking about how you like to camp, where you camp, and of course, the weather you camp in. 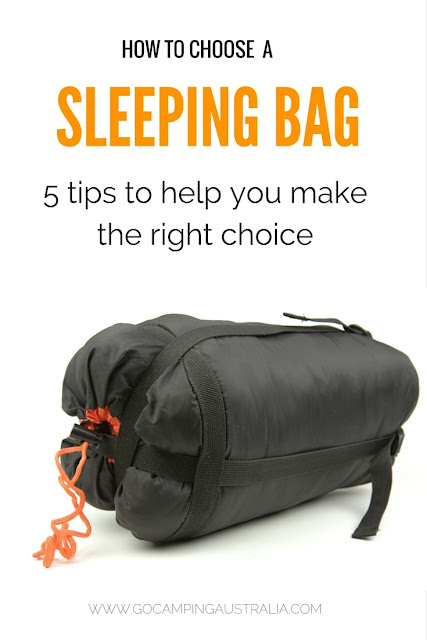 With that in mind, read on to find out 5 tips to choosing the right sleeping bag. The temperature rating on a bag is a guide (and I stress the word, guide) on the lowest temperature the bag is designed to keep you warm in. So a bag that has a rating of 5 degrees Celsius, should theoretically keep you warm when the mercury gets to 5 degrees. The manufacturers testing of this temperature rating isn’t known, and a lot of factors also need to be considered on how effective that bag will be. Your sleeping mat, if you are a warm or cold sleeper, the clothes you are wearing in the bag, the shelter you are in during the night, etc. All factors that might alter how you feel in the bag. So what do you look for in a rating? Think about the lowest temp you think you will be camping in with this bag (not just the first trip, but any trip you are planning on using it). Then subtract 10 degrees from that temperature. And with that new temperature, choose a sleeping bag with that rating. eg. You think the coldest place you will camp in will be about 0 degrees. Choose a bag rated to minus 10 degrees. This might seem a little excessive, but it's easier to cool down in a too-warm sleeping bag, by unzipping it. Trying to get warm in a not-warm-enough bag is harder (and can lead to a sleepless night). What about the ratings on the bag? You might see on a sleeping bag, 3 levels of comfort rating and this is based on the EN 13537 rating, which means it's the official European standard for the labelling of sleeping bags. Comfort - that's what a standard night sleep would be like for a 'standard' woman, because women need more insulation than men apparently. It's the warmth level that women would like for a comfortable night's sleep. 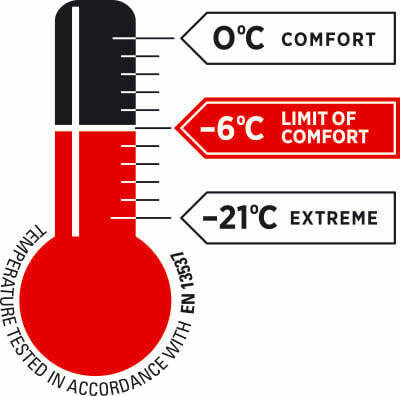 Limit of comfort - This is the lowest temperature that a 'standard' man would need for a comfortable nights sleep. I am not sure what constitutes a 'standard' man, or woman (as above mentions) but it assumes you are not sleeping naked and have some insulation underneath you. Extreme - This is the coldest temperature you can survive in, in this particular bag without freezing to death. Now under the standard EN13537 for sleeping bag ratings, they classify this 'extreme' rating as follows, "a strong sensation of cold has to be expected and there is a risk of health damage due to hypothermia". Of course, you shouldn't be relying on any sleeping bag to save you from hypothermia, and use this as a guide only. If you want to read more about the EN 13537 rating standards and validity, there is a paper from the Outdoor Industry which discusses in detail. Another big choice will be the filling for the bag. Do you choose synthetic or down? They both have pro’s and con’s about them as you can tell. But what one to choose? That will come down to your budget and your style of camping. Down is a good long term choice, and will suit anyone – and where weight and bulk is a consideration, you can’t do better. There are different sorts of down too, and that affects price and warmth in the bag as well. The higher the concentration of down feathers, the better. So a down of 850+ is superior to one of 600+. Simple! Synthetics are good if you plan on being on in wet conditions, and on a budget. And if you don’t plan on being a regular camper – the more casual or not so sure about camping sort of person, then this will be a good choice and an economical one. You might find if you enjoy camping, that you need to upgrade later. Looking for a good range of sleeping bags? Before we move onto the next point, it's very important that we mention the use of down and the ethical treatment of animals to produce this down. This was raised in comments when we first published this story, and it was remiss of us not to address at the time. When purchasing a down product (whether it be a sleeping bag or a jacket), you should check that it was ethically sourced. Unfortunately, big business means ill treatment of animals in the past, and the down from ducks and geese have meant extreme cruelty against these animals. It still goes on, but you as a consumer can make a choice. That means looking for companies that follow the Responsible Down Standard. It's a voluntary standard, so not every company will participate so you need to do some homework. Read about the Responsible Down Standard and what it means here. The list of outdoor companies that use this standard can be found here. Patagonia has their own Traceable Down Standard. Is this RDS a guarantee? I am not sure....there can be no guarantees. PETA has recently put out information saying the unethical treatment of animals continues. You can read their current story on live plucking. It is very distressing to read and see. Tapered rectangular is just as it sounds. They taper down to the foot of the bag, like the mummy, but not as much. More wriggle room and a good all-rounder shaped bag. A rectangular bag is…..rectangular! Even more wriggle room, and tend to be the sort of bag you would use if you don’t have to worry about weight or size. Plenty of room inside, and a generalist camping bag. This goes together with the shape (point 3). It’s about finding the bag that suits you. Not only do bags come in different shapes, but different sizes too. Some bags are different lengths to cater for tall or short people. Other bags are based on gender – some female bags might be narrow at the top, but a little wider at the hips. And typically (but not always), women are considered “cold sleepers” and some bags cater for women, with woman sleeping bags with extra insulation provided. A pink colored sleeping bag doesn’t make it a women's sleeping bag. With other bags, regardless of gender, the fit of the bag will depend on the individual, so trying the bag out in a shop is a good idea (if that is possible). Are you looking for a double sleeping bag? If so, read how to choose a double sleeping bag in this story. The little touches are important when choosing a bag. Easy to overlook in favour of the above 4 points, but still worth considering. Whatever the sort of sleeping bag you want to choose, do your homework. Some bags are not cheap – so make sure you get the one that is right for you and your camping. Editors Note: This story was originally published in 2014 but has been updated for accuracy and comprehensiveness.